Achieving Work-Life Balance: Celebrating Success | Vickery and Co.
You know how you feel when you have just nailed a client meeting or finished creating that course you are about to sell? That feeling of excitement and pride? That is a powerful feeling, one that helps you stay charged and ready to move on to the next big thing. That is a feeling that should always be celebrated. I firmly believe that celebrating successes, no matter how small, is the key to motivation and even bigger successes. 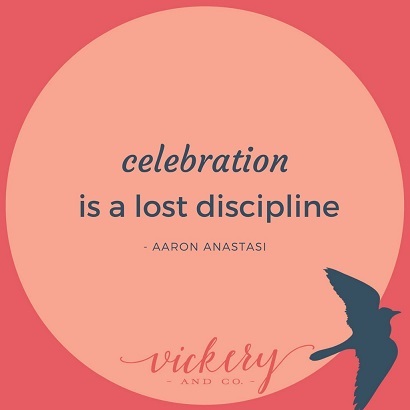 Aaron Anastasi, the author of The Voice of Your Dreams, once told me, “celebration is a lost discipline” and I think he is right. There is something magical about the art of celebration. To truly celebrate all of your wins, personally and professionally, and not discredit the small ones, takes a lot of discipline. It also reaps the biggest rewards. Imagine having that feeling I mentioned above woven through your life on a daily basis? Picture it, if you will: you feel awesome way more than you feel overwhelmed. There is always something to celebrate. One of the ways I tap into all of the amazing elements worth celebrating is through a gratitude routine. I spend a few minutes each day writing down all of the things I am grateful for that day. Today, for example, I am already grateful that I managed to get my kids off to school on time (no easy feat with four kids and three schools), that I have a warm cup of tea, and am sitting down to write this post at exactly the time I intended to. I am also grateful for the clients I will service today and the podcast interview I’m about to give. Taking the time to acknowledge gratitude gives me reason to celebrate. It instills a level of pride that I may otherwise lack. I even celebrate with my “wins” accountability partner each Friday morning. I make every effort to bring celebration into as many aspects of my life as possible. Each of us defines success differently. I truly believe that, for me, success is found in even the smallest of achievements. I have found that to create the work-life balance I desire, I must celebrate every success, even if it seems inconsequential. Huge, fantastic leaps are wonderful, but never forget that it takes many small steps to achieve those larger goals. Don’t forget about them along the way; they are the stepping stones that get you where you want to go. I also love to celebrate my success with rewards. Yep, you heard me, rewards. That sounds exciting, doesn’t it? I love rewards (just ask my clients). Here are just a few ways I celebrate by rewarding myself. Notice that they range from tiny rewards to really big ones! Because we all have days where we are super productive and days where achieving a small task feels like a major win, I encourage you to give each success its due celebration. Success is success, even if it looks different today than it did yesterday. So tell me, how do you like to celebrate success? I always love hearing from my readers so drop me a line via email, Facebook or even on Instagram to let me know and thank you for being on this journey with me. Today I am celebrating you!